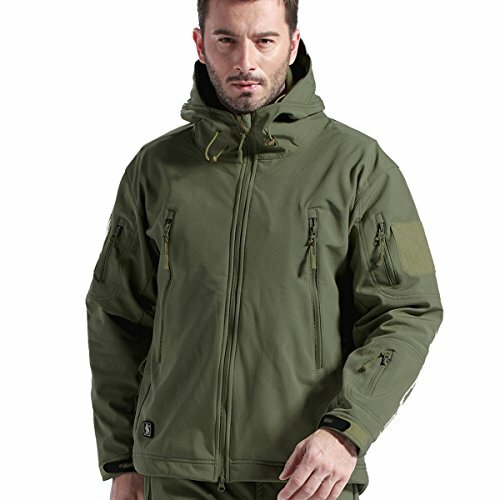 FREE SOLDIER Military Soft Shell Jacket. DINTEX Elastic fabic,It won't strain your sport and give you more space in movement. High-tech waterproof fabric,with the same effect as the lotus leaf,keep you dry in wet weather. The internal fleece lining fabric is Shrink resistance and anti-static,Good warming effect. The collar with a brim of the hat,preventing from getting wet,wind and water resistant.Collar with contraction rope,prevent wind from drilling into neck. Multi-function chest pocket with hanging ring,you can carry mobile phones,headphones,keys and other tools. Pockets are zipper design,to ensure your items safety. Back pocket large capacity,it can replace the backpack. OUTER SHELL:Elastic DINTEX fabic withTeflon coating water resistance,keep you dry in light rain day and outdoor activities. MULTI-POCKET:2 chest zipper pockets,built-in hanging ring,2 arm portable pockets with Velcro,1 forearm pocket,back large zipper connected pocket. CHARACTERISTICS:Breathable 8000mm fleece lining keep you warm,armpit breathable zipper,adjustable wrist cuffs,double-reinforced elbow. FUNCTION:Shell hooded jacket,adjustable drawstring provide maximal rain protection in bad weather,fleece chin guard prontect you well. SUITED:Army outdoor jacket,autumn jacket,winter jacket,hiking jacket,climbing jacket,fishing jacket,hunting jacket,skiing jacket,camping jacket,tactical jacket,etc. Manufacturer: FREE SOLDIER OUTDOOR PRODUCTS LLC. Publisher: FREE SOLDIER OUTDOOR PRODUCTS LLC. Studio: FREE SOLDIER OUTDOOR PRODUCTS LLC.